Happy Autumn and happy Friday, sweet friends! Today, you are in for a special treat. My sweet blogging friend, Angelina at Petite Haus, has organized a fall tablescape tour featuring 10 bloggers. A schedule of the participating tables will be listed at the end of this post. If you are visiting from, Lincluden Cottage Life, welcome. Rebecca has such a beautiful 1859 home that she restored in New Brunswick, Canada. 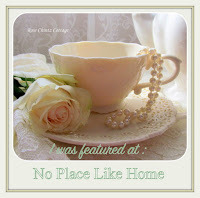 I have always admired her decorating style and her gorgeous home! For this tablescape, I really wanted to be outdoors, but the weather has been rainy and cloudy. However, I’m not going to complain because we really need the rain. When it comes to autumn, I adore the true colors of fall…the reds, burnt oranges, yellows, greens, and golds. The tablescape I prepared today reflects this love. For the tablecloth, I chose a deep blue cloth adorned with orange, yellow, and green flowers. The placesettings are comprised of gold scalloped charger plates, my favorite china (Italian Blue Spode) and white Limoges china. Pumpkins and fall berries finish off each setting. A trip to Trader Joe’s inspired the centerpiece in the pumpkin pitcher. They have the prettiest flowers at the best prices. I really love this color combination. The next stop on the tour is another sweet blogging friend of mine, Amber at Follow the Yellow Brick Home. Amber’s home is adorned with so many pretty vintage finds. Be sure to visit the other tables on the tour. I know that you will find lots of inspiration for your fall tables. Thank you so much for your visits and comments. I hope that you have a happy and blessed day. Enjoy your weekend, dear friends!!! Shannon, what a stunning autumn tablescape in your lovely home. The tablecloth is so pretty and is the perfect underpinning for your plate stack. The floral arrangement in the pumpkin pitcher is stunning with all the colors of fall! Wishing you a wonderful Friday sweet friend! Good morning friend! Your beautiful table is my first stop, and it’s gorgeous!! The layering is everything!!! Layers upon layers of Autumn goodness! My eyes are popping! Happy Fall Shannon! How beautiful! I love all the layers – and of course all the blue! Shannon, everything is so lovely. It looks as though you are having a Welcome Autumn party, your guests will be thrilled with your table. Your floral arrangement is so pretty in the pumpkin pitcher and is perfect for your table. Have a wonderful day and weekend. Happy Autumn, sweet friend! So pretty! I love the vase the flowers are in. so pretty Shannon…definitely speaking the Fall/Autumn language. Love the pumpkin vase and the flowers. Lovely. Shannon, what a gorgeous table! Love the tablecloth and that centerpiece! Everything is just Beautiful, Shannon! Love your traditional Fall colors! Your table is so beautiful! I love the pumpkin pitcher in the center. The oranges go so well with the beautiful blue tablecloth. You styled the traditional Fall colors so wonderfully! Shannon, Your flowers are beautiful! I love the container! Your plate stack is so pretty with all the colors, textures, and shapes. That tablecloth pulls everything together so well. Oh those flowers are just so perfect for fall! I love the beautiful traditional colors you have chosen. The shot with the table and window in the background and the dough bowl with the pink pumpkin, tole tray, tiered tray, and rooster is my favorite. Such a lovely tablescape to welcome the season! I love how colorful it all looks! Very inviting. Don’t we all love Trader Joe’s flowers too? Hard to beat them. I love your beautiful fall tablescape, and all the fabulous fall colors which says, come on in, have a seat, and enjoy dinner. Thanks for sharing. One of my favorite things about Fall are the colors and you have pulled them together in the most beautiful way! Love your layers on the table in your place settings! It’s just stunning! This is beautiful Shannon. Love the tablecloth and the mix of blues with the traditional autumn colors. The floral arrangement is gorgeous- wonderful colors and beautifully arranged! Shannon, your table of Traditional Autumn is simply exquisite…it just makes you smile with sheer delight!….and I can’t help but admire your amazing floor too! Have a great day Shannon! I love the berries! Such a pretty fall table. Oh my goodness Shannon, your table is gorgeous. I LOVE LOVE blue and orange together. Especially during autumn. The pumpkin pitcher with the fall tone flowers is beautiful and I particularly like pumpkin and berries at each place setting. Every detail is lovely. It’s been raining here too but I got lucky the day I styled my table. It did not rain!!! It was fun joining you on this fall tablescape blog hop.